Love yourself – love your skin! You know, loves, I’ve talked about my dry skin many times (and I hope you’ve not already fallen asleep at this point, because I’m talking about it again today, so WAKEY WAKEY!) and even though I’m already really happy with the skincare products I use on a daily basis, I’m always happy to try out something new as well. Perhaps as an alternative, because sometimes I feel that from time to time, even my skin needs a little change. Or perhaps, this might be helpful for some of you who are still on the hunt for the ideal skincare series for themselves. 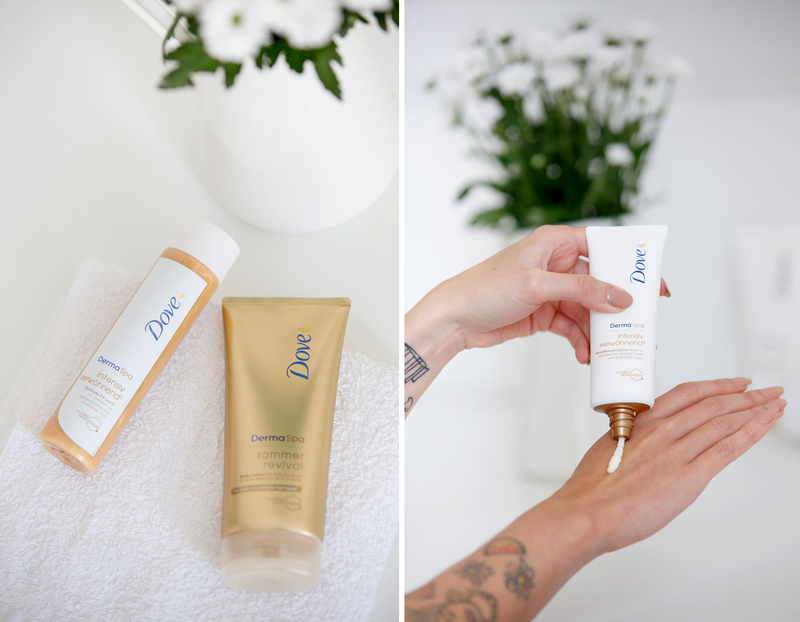 Whatever the case might be, today I want to present the new premium line Dove DermaSpa* skincare series to you all. You know, a little bit of spa quality time for yourselves at home. 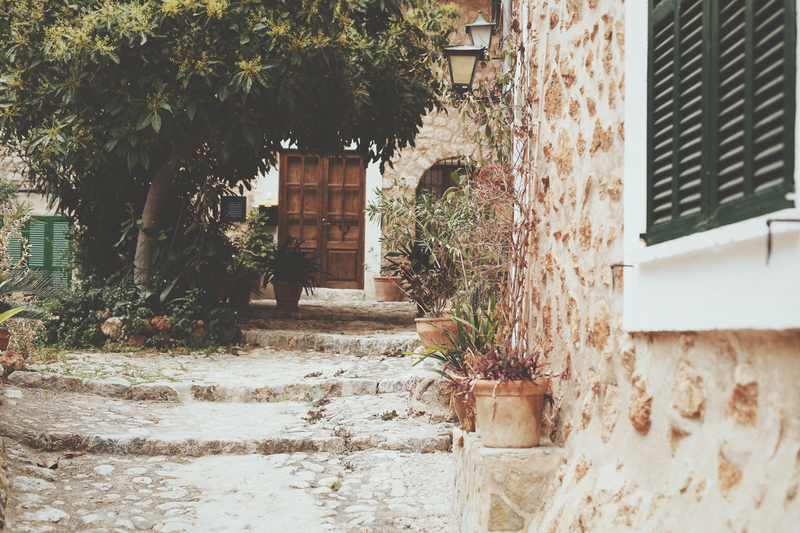 Who doesn’t love a little wellness and especially if you don’t have to leave your flat for it (am I seeing you nodding: “yes yes yes” already?). 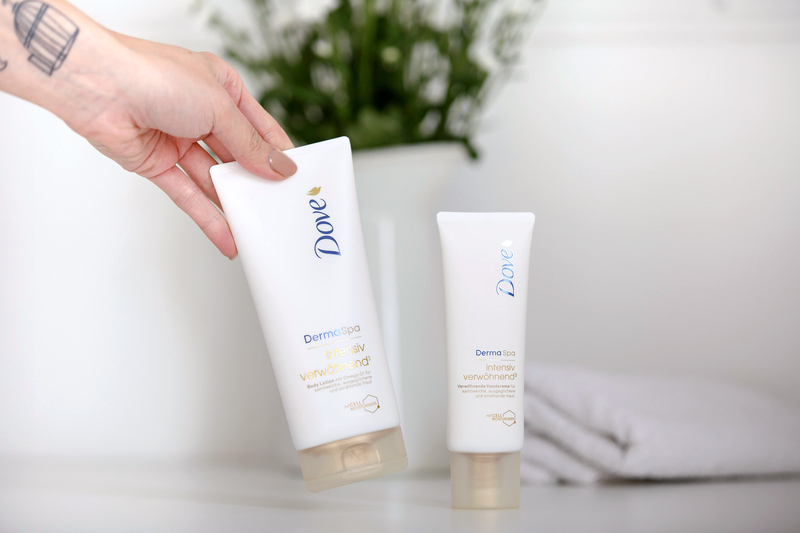 The smell of the new Dove DermaSpa series is so very “SPA” that it really deserves its name. The three lines are called „Straffend+” „Intensiv Verwöhnend³” and „Sommer Revival” and the feeling on my skin after application was high class and very soft with all the products. All DermaSpa products are based on a new technology called Cell-Moisturizers™ which perfectly moisturizes the skin. Unfortunately, the “Intensiv Verwöhnend³” body lotion for dry skin didn’t really soak in after using it but the hand lotion and body oil felt perfectly soft and didn’t have the same effect as the body lotion. The self-tanning body lotion “Sommer Revival” is also really nice on the skin, but I really wanna move away from self-tanning. I got so tan this summer thanks to spending so much time in the sun, I guess I just wanna start to accept my paleness come winter. But hey, after using the self-tanning lotion once on my legs, I had the impression that it didn’t smell as horrible as most self-tanners (you know what kind of smell I mean, right? The developer, wuahh!). No, this one is really good and smells rather lovely compared to the Dove self-tanning body lotion I used in the past 2 years. Finally, I have to say: I ALWAYS use some body lotion after showering – quoting the Dove Body Love Report, 81% of the interviewed women from Germany, Great Britain and the Netherlands do the same, at least once a week – , I ALWAYS use a day and a night cream for my face – after all, around 69% of the questioned women treat their face in the same way on a daily basis -, AND, especially in winter, I always use hand cream as well. The only part that I’m usually ignoring is my feet – which is bad and ugly, I know, but they’re so far away from my brain, so I tend to forget them. Silly me. 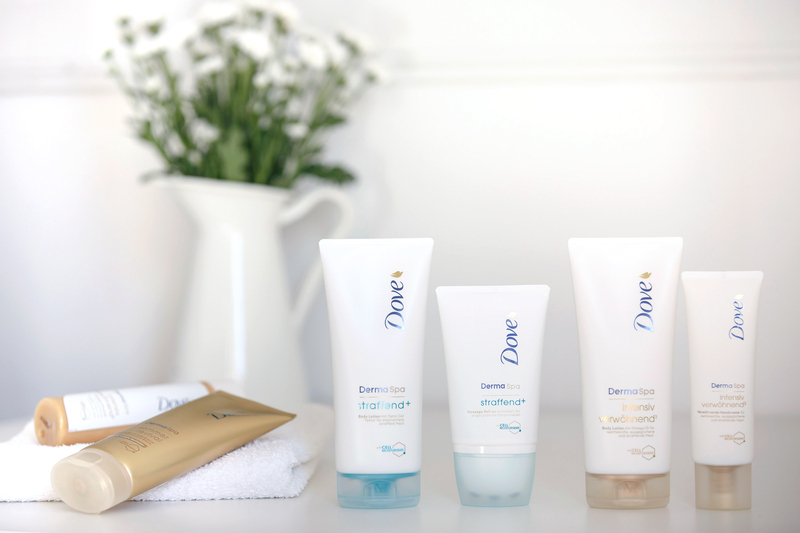 But with this luxurious new skincare series by Dove, you might wanna get used to a routine like that as well. Don’t forget your skin, ever. It will thank you later, I promise! WOOOWWWW was für wunderschöne Bilder! So sinnlich und das Thema SPA perfekt aufgegriffen. Genial! Hm I haven’t used Dove in years, is this exclusive new range really that good? I might have to try it out, seems promising. Thanks for sharing! Da muss ich auf jeden Fall mal dran schnuppern!